Bolt d’Oro (28 first-place votes, 429 points), expected to run in Saturday’s Santa Anita Derby, retained the top spot in the NTRA Top 3-Year-Old Poll, results of which were released today by the National Thoroughbred Racing Association (NTRA). 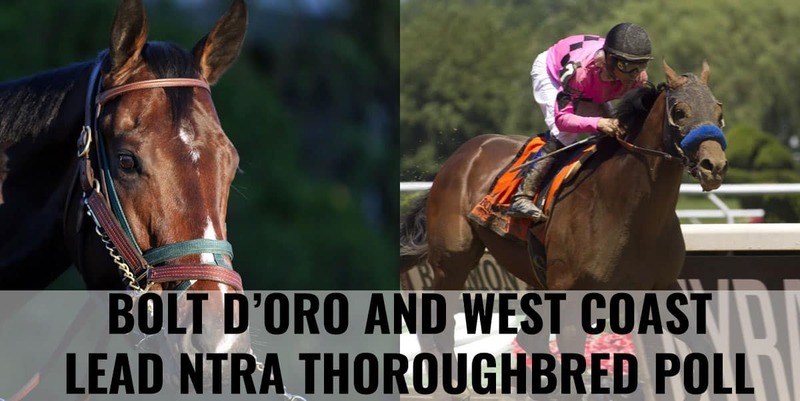 Owned and trained by Mick Ruis, Bolt d’Oro was a multiple Grade 1 winner at two and won his 3-year-old debut in last month’s San Felipe Stakes (G2) at Santa Anita. His chief Southern California rival, McKinzie (3; 237), first across the wire in the San Felipe but disqualified to second for bumping in the stretch, dropped to fifth in the poll upon news that he will miss the Santa Anita Derby. Oaklawn Park’s Rebel Stakes (G2) winner Magnum Moon (259) did not race but dropped to fourth as the result of the ascendance of Audible and Mendollsohn. The remainder of the top 10, in order (with poll points): Good Magic (200), Justify (172); Noble Indy (170); Enticed (128); and Solomini (84). New to the top 10 this week is crack sprinter Mind Your Biscuits (3; 243), who won the Dubai Golden Shaheen for the second year in a row. The full results for both weekly NTRA Thoroughbred polls can be found on the NTRA website at: http://ntra.kinsta.com/ntra-top-thoroughbred-poll-april-2-2018. Full accounting of top 10 votes, by voter: http://ntra.kinsta.com/wp-content/uploads/Polls-week10-by_voter-2018.pdf.